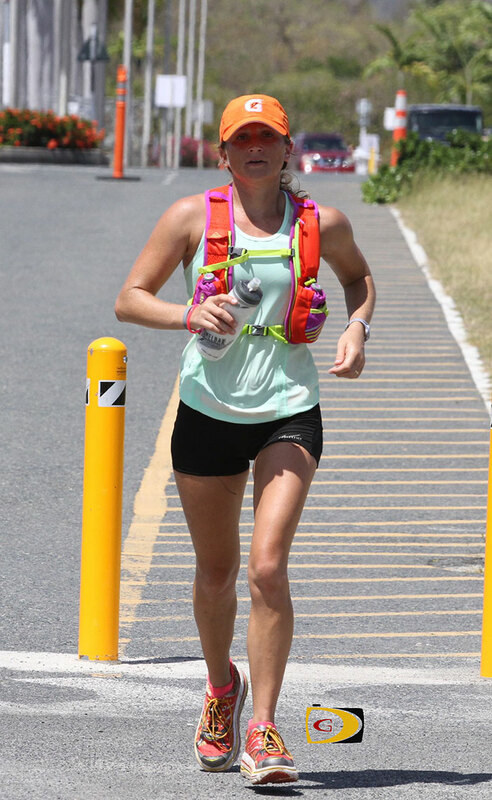 After overtaking Virgin Gorda’s Kathleen Brownsdon, then her counterpart Curwin Andrews on the hill out of Cane Garden Bay, St. Croix’s Bridget Klein led a women’s sweep of the top spots in Saturday’s inaugural 50km Tortola Torture—a punishing 50km hilly race covering more than half of the island. Andrews burned through the first half of the race in 2 hours in 15 minutes, then paid the price. He was passed by Brownsdon then Klein who overhauled Brownsdon and went on to win by 17 minutes in 5 hours, 25 minutes and 59 seconds—leading three women as the first individual finishers. Brownsdon was second in 5:43.30 and Klein’s St. Croix counterpart Pam Terry placed third in 5:57.33—the only three finishers under 6:00 hours. Tom Cripps was the first male finisher in 6:02.43 and was followed by Jacques Roux in second in 6:11.21. Andrews placed third in 6:13.37. The relay team of Anna Kinkead, Mike Killoury and Julius Farley, were first across the line in 5:08.33. Final results; Women: 1. Bridget Klein, St. Croix, 5 hours, 25 minutes and 59 seconds. 2. Kathleen Brownsdon, 5:43.30. 3. Pam Terry, St. Croix, 5:57.38. 4. Jenny McIvor, 6:06.18. 5. Becky Roulette, 6:11.21. 6. NiMade Oniasih, 6:51.32. 7. Casey McNutt, 7:22.52. 8. Richie Paul, 8:03.39. 9. Philomena Robertson, 8:48.07. Dnf; Chantelle White and Julie Reynolds. Men: 1. Tom Cripps, 6:02.43. 2. Jacques Roux, 6:11.21. 3. Curwin Andrews, 6:13.37. 4. Mike Klein, St. Croix, 6:14.33. 5. Simon Cook, 6:28.06. 7. Ray Wearmouth, 6:58.49. 8. Russell Crumpler, 7:06.12. 8. Richard Morgan, 7:36.39. 9. Ravi Sukhu, 7:56.27. 10. Gary Salter, 8:27.44. 11. John Redmon, 8:28.23. 12. Ken Krys, 10:26.38. 12. Andrew Blackburn, 12:31.51. 13. Andrew Gilliland, 12:31.51. Dnf, Howard Moore and Dan Wise. Teams: 2 Man: 1. Kerry Dos Santos, Rod Dos Santos, 6:06.56. 2. Yummy Mummies, Gillian Plaxton, Jessica Santos, 7:42.56. Three Person teams: 1. Demon Deacons, BVI. Anna Kinkead, Mike Killoury, Julius Farley, 5:08.33. 2. Dream(ish) Team: Katrina Crumpler, Ben Mays, Maria Mays, 5:11.19. 3. Rose Between 2 Thorns: Rosmond Johnson, Lisa Adamson, Emma Holmes, 5:44.52. 4. Snails Through Treacle: Kate Henderson, Paul Hubbard, Jude Holmes, 6:15.12. 5. Adam’s Angels, Candy Wilks, Judy Haycraft, Adam Hodlt, 6:19.04. 6. Waaler Ferrari: Sharon Waaler, Claudia Ferrari, Cameron Waaler, 6:22.04. 7. Tortola Tortoises: Ghislaine Hoogendjik, Shane Donovan, Sarah Graham, 6:62.26. 8. Tek Dat #2: Henry Creque, Marvin Flax, Guy-Paul Dubois, 7:39.48. 9. Tek Dat #1: Christopher Smith, Patlian Johnson, Barbara Smith, 8:26.23. Corporate Cup: Conyers Dill & Pearman: 1. Patrick Ormand, Tameka Davis, Anton Goldstein, 5:36.22. 2. Tricor Tigers, Gareth Watkins, Lisa Birdson, Claire Burke, 6:23.26. 3. Deloitte Dashers: Tia Beckman, Tash Rusheinski, Aurelie Legangneux, 6:41.40. O’Neal Webster: Marianne Cave, Luke Plummer, 7:12.05.